Advances in Petroleum Exploration and Development is devoted to promoting the development of petroleum exploration and development, and builds the bridge between the geology and the engineering of petroleum and natural gas. 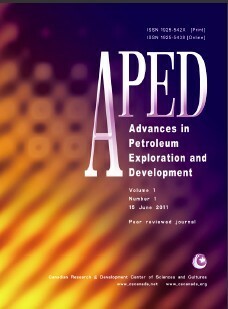 APED covers the fields of petroleum (natural gas) geology, exploration and development in its broadest possible sense. It publishes peer-reviewed original scholarly high-quality work such as analytical, numerical, or experimental results and physical analysis of processes of lasting scientific value. Those pertaining to modeling, theory, analysis, simulations, technology development, experiments, visualization and measurement techniques are also appropriate for the journal. High-quality research papers are solicited in, but are not limited to. Advances in Petroleum Exploration and Development is indexed by CAS of America, DOAJ of Sweden, CNKI of China, Journal TOCs of England, Open J-gate of India, and ProQuest LIC. It is filed by Library and Archives Canada, Gale, EBSCO Publishing, Ulrich's of America, and collected by the database AMICUS of Canada. 1. The manuscripts are required to be written in English, and they should be submitted to aped@cscanada.net or caooc@hotmail.com. 5. The copyright of the articles goes to the authors, while APED owns the first publishing right. 6. As for the publication fees, 60% of the articles are free, on the basis of assessment results given by our editorial team. Excellent articles will be published with no charge, but others will not.